While many Caribbean islands produce rum, Martinique is the only one to have a legally-protected appellation d'origine contrôlée (AOC). Thus, just as only sparkling wine produced in the Champagne region of France can legally be called champagne, only rum made in Martinique can be labeled AOC Martinique Rhum Agricole. The distinction between this rum and other rums is more than a matter of marketing. Rhum Agricole is made from sugarcane juice whereas most rums (i.e., “industrial rums”) are made from molasses, which is cheaper and easier to work with. In addition, to qualify as Martinique Rhum Agricole, the distillery has to observe the strict standards established by the Institut National des Appellations d'Origine (INAO). No artificial colors or artificial flavorings may be added. Martinique has had a long association with rum. 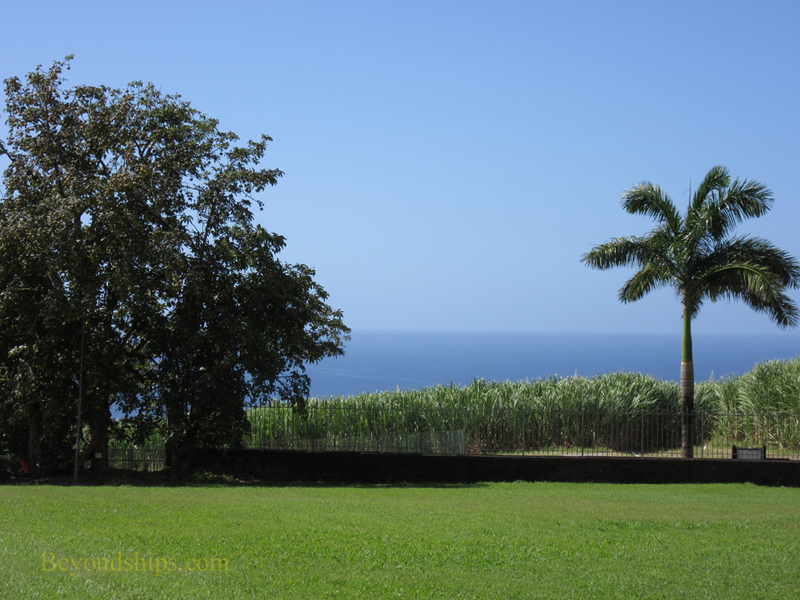 Sugarcane was first planted in 1640 and for most of the island's history, sugarcane was the principal crop. Indeed, it is said that in the negotiations ending the Seven Years War, France relinquished her claim to Canada in order to be able to keep Martinique because of its lucrative sugarcane industry. (Of course, the fact that the British had already defeated the French army in Canada probably made this concession easier). In 1650, Father Jacques du Tetre built a still in order to supplement the island's sugar production with rum making. Some 40 years later Father Jean Baptiste Labat arrived bringing with him advances in distillation. Many surviving traditions are still attributed to Father Labat. As world sugar production turned from cane to beets in the 19th century, rum shifted from being a byproduct to being the primary reason for continuing to grow some sugarcane on Martinique. There are a handful of distilleries currently producing rum on Martinique. The three best known are the Habitation Clement, the Saint-James Distillery and the Depaz Distillery. Sitting in the shadow of Mt. Pelee on Morne Rouge, the Depaz estate traces its origins back to 1651. However, this pretty estate was totally destroyed in the early days of the 20th century. In 1902, Mt. Pelee erupted laying waste to the northeast section of the Martinique. All the members of the Depaz family were killed in the eruption except Victor Depaz who was away studying in France. Fifteen years later, Victor returned and rebuilt the estate including the distillery. Within a few years, Depaz rum was winning awards in international competitions. The estate attributes much of its success to the fact that it uses only blue sugarcane. This type of cane contains a higher percentage of sugar juice than other types of cane used in rum making. At harvest time, it is brought from the neighboring fields into the distillery as soon as it is cut. In addition, the rum is aged in charred oak barrels, which help to give it flavor and color. Visitors to the estate can explore independently or take a complimentary guided tour. 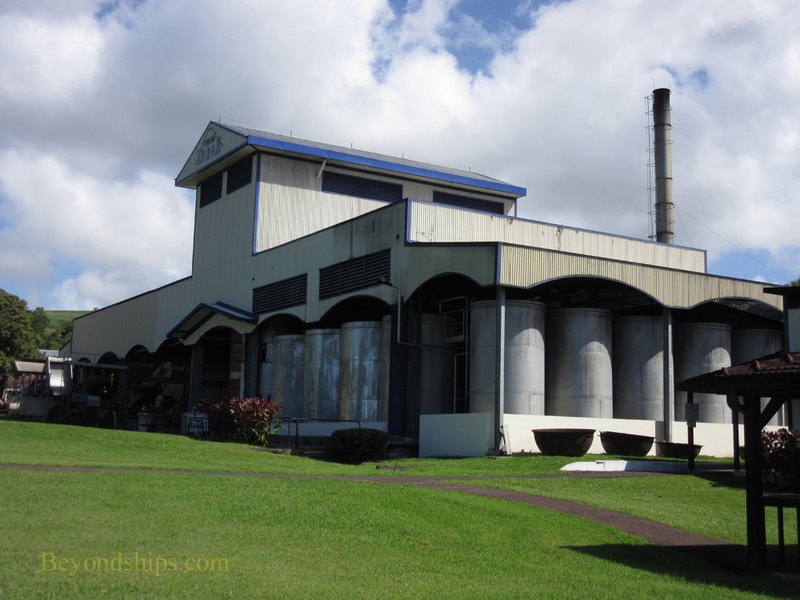 In the distillery, you see the steam-powered machine that shreds and crushes the cane to release the juice, the fermentation tanks, the tall copper stills, and the barrels in which the rum is aged. Some 25,000 litres of rum are produced per day. Signs in French and English explain the process. Outside, there is an old but still turning waterwheel used to provide power. You can also visit the restored estate house and out buildings on the park-like grounds. There is a view of the Caribbean across the adjoining cane field. 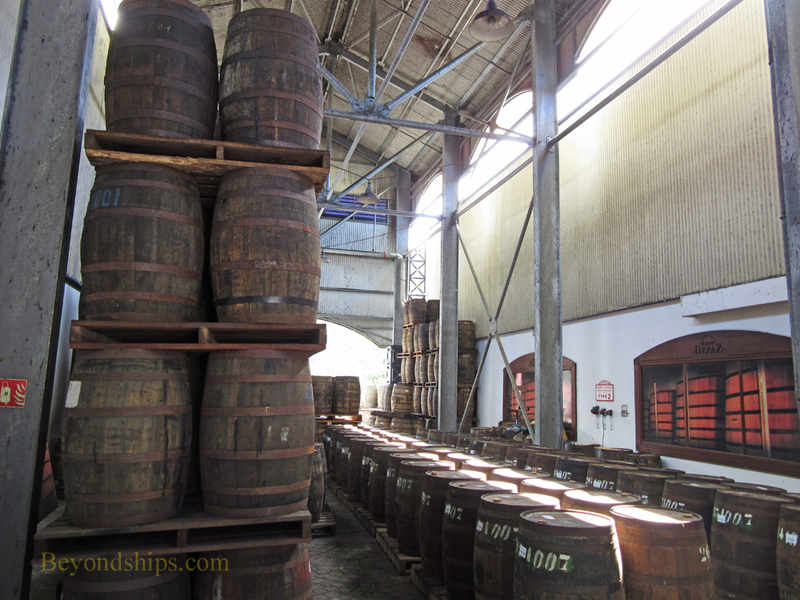 We have been to several rum distilleries across the Caribbean. The Depaz Distillery has the most picturesque setting. It is not as large as the Bacardi operation in San Juan but is a sophisicated plant and more of the operation is open to view. The Depaz Distillery is open to visitors free of charge. It has a shop where visitors can buy the product as well as a restaurant. Above: The old family estate house at the Depaz Distillery. Below: Fields of suagrcane extend from the ditillery down to the sea. 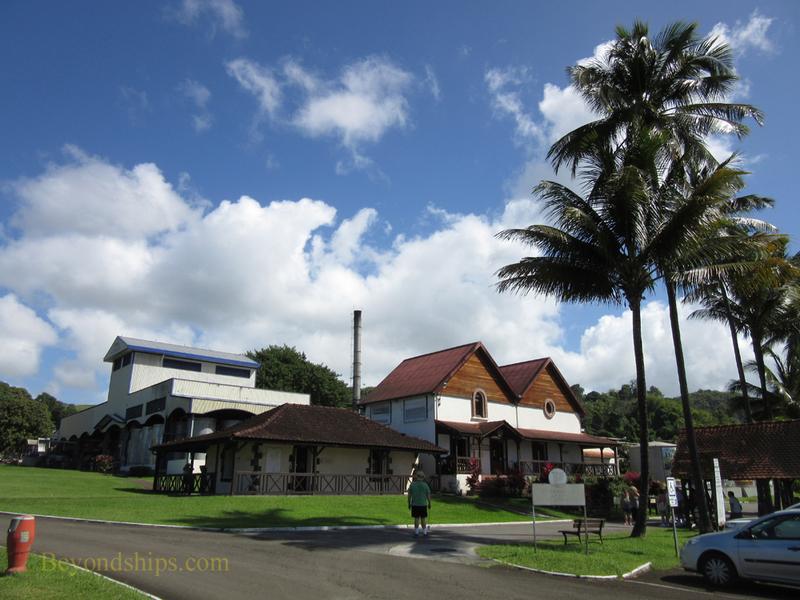 Above: In deference to the tropical climate, the walls of the distillery are open. 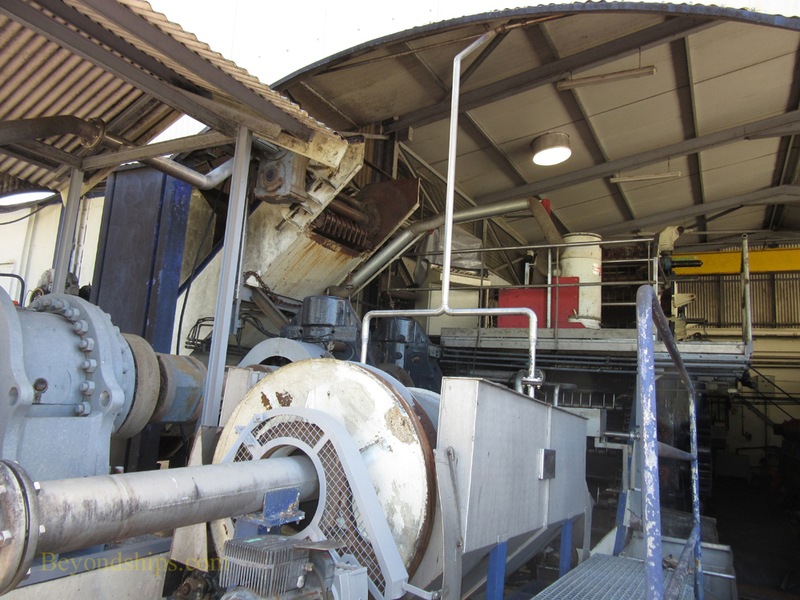 Below: Machinery used in crushing the sugarcane. Below: Rhum aging in oak barrels.